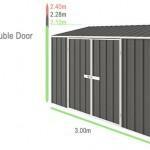 Take a look at our EasySheds range. These are Australian made using Bluescope Steel and Colorbond colour range. With the thickest steel at 0.35mm, these are far more rigid than the ‘cheap’ imported sheds. Stick with the brands you trust. Most of the EasyShed range has extra wall height options and the abilty to change the hinged door/s to sliding door/s. We have models with no rear wall to secure to your existing wall called the ‘Off the Wall’ series. 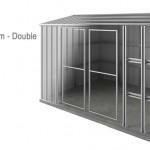 There is the Storm series which are designed for Cyclonic conditions and are the strongest shed on the market. 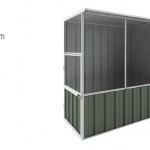 Then there are the Aviary range of EasyShed Garden Sheds EasyShed Aviary Sheds and even Garages. This entry was posted by GardenShed.com in Brand, EasyShed. ← Why a Colorbond Shed?